The Great Recession, and resulting private and public sector bankruptcies, served to hasten long-overdue cost-cutting and product rationalization in Michigan. The result is one of the state’s longest economic expansions on record. More than ever, political activity in America has become interwoven with the fabric of economic outlooks. Indeed, another national election year is on the horizon. True to form, 2016 promises to be a record-shattering year for media advertising outlays and political lobbying expenditures. Economically speaking, there will be positive short-term spinoffs, as well. As far as the outlook in Michigan and the Detroit area, these external factors must be considered. For example, over the past 100 years, the following pattern has prevailed: There have been 18 economic downturns, and six of the recessions have coincided with a presidential election year — influencing public opinion as to economic security and the overall financial outlook. Notably, in five of these six cases where real GDP stumbled during a national election year, control of the White House in the following year shifted to the other political party. Correspondingly, such shifts most often resulted in wholesale changes of economic and financial policies, significantly altering GDP growth, inflation, interest rates, and consumer buying power. Especially with reference to consumer buying power, if a Republican wins the White House next November, major policy alterations would affect Detroiters and Michigan’s auto industry. Already, Republican candidate Donald Trump has suggested General Motors, Ford, and Fiat USA (Chrysler), along with their related suppliers, cease their operations in Mexico and move production back to the United States, most notably in low-cost labor markets in the South. While economic changes cause households to reassess whether the time is right for purchasing or financing automobiles, moving factories thousands of miles is another matter altogether. An interesting corollary to these potential political outcomes is the power of a failing economy to demolish the incumbency or legacy of a sitting president. In two well-known episodes, prospects for another four years in the White House were denied to Jimmy Carter (lost to Ronald Reagan in 1980) and Herbert Hoover (lost to Franklin Delano Roosevelt in 1932). Carter’s loss was largely attributed to the horrific effects of raging inflation, shrinking payroll employment, and the impact of joblessness on wealth creation and confidence. Hoover’s loss was also inevitable — the Great Depression embodied all of Carter’s economic nemeses, compounded. When President Obama exits the White House, he will leave behind billions of dollars of unfunded social and infrastructure programs ranging from the Affordable Care Act to crippling restrictions on coal-powered energy plants and a resulting shift to “green” energy, to Social Security (although past presidents have also failed to deal with the latter). The U.S. economy has been chugging along, unevenly, over the past six years. Typically, real GDP expansions average 3.2 percent each year. The current cyclical expansion, however, has averaged just 2.3 percent. In fact, since 2007 (the prior peak), real GDP has risen at the anemic rate of 1.2 percent per year. This slower-than-normal expansion explains the equally disappointing gains in overall U.S. wages and salaries. On the plus side, whereas most expansions recede after three or four years, it now appears likely that we’ll add a seventh year to this upswing (i.e., midyear 2009 through mid-year 2016). Most encouraging, especially for Michigan and its 13 metro regions, the state has ranked very near the top in growth over the past three years, compared with the other 50 states. The state’s economy has typically exhibited its most robust growth during the first two years of an expansion, reflecting how the initial years of recovery capture pent-up demand for auto purchases that were deferred during recessions. Michigan’s superior growth at the outset of the recovery also conforms to that portion of the business cycle in which auto-financing rates remain low and payrolls are once again accelerating, thanks to longer workweeks and new hiring. In many respects, the slow but steady growth of the national economy has been opportune for Detroit’s automotive manufacturing sector and profitability. A moderately paced U.S. recovery has prolonged the low-cost-financing phase of the cycle and kept inflation rates at bay. Both factors have contributed immensely to a stupendous wealth effect, illustrated by midyear peaks in U.S. stock and bond markets. As of midyear 2015, according to a Federal Reserve study, U.S. Household Net Worth, the cumulative wealth on household balance sheets exceeded $85 trillion — a gain of $28 trillion between 2007 and 2015. Most of this rising wealth stream reflects higher home values and surges in stock and bond market prices. Moreover, lower-than-expected inflation rates have allowed consumer purchasing power to improve, albeit slowly. So essentially, even though gains in overall personal income have performed below expectations, the injury to household finances has been offset — largely by gains in stock portfolios and property values. In the search for an explanation as to why the present recovery differs from its predecessors, this dichotomy between growth rates of incomes and wealth is key. Most analysts and market participants recognize a widening income gap among American households. Much of this troubling development stems from comparing situations of households with members experiencing full-time employment versus those households struggling with multiple part-time jobs or, worse, a longer and deeper monetary dependence on public sector subsidies. Indeed, this dichotomy threatens the longer-term financial and social stability of cities and states, as well as the fiscal and economic condition of the nation. Once again, the best economic friend of Michigan and its auto industry is consumer optimism. Confidence and energy are generated by rising real incomes and wealth, the availability of affordable auto and home financing, and better employment prospects. For Michigan, and especially for the continuity of metro Detroit’s 2012 to 2015 business revival, results have been utterly astounding in two respects. First, the pattern of resurgence has departed radically from historical experience. Our state and local economies typically accelerate faster than the national economy in the first year or two of recovery, and then fade below the national expansion rates in the third and fourth years prior to recession. A reverse pattern has prevailed thus far. In the early, climb-out phase of this recovery (2009-2011), our state and local economies gained momentum much more slowly than normal. For example, as of midyear 2009, sales of motor vehicles in the U.S. marketplace had fallen to an 11.1 million unit annual pace — the start of the current expansion — but had only reached a 12.6 million unit selling pace by mid-2011. In contrast, between midyears 2012 and 2015, total auto and truck sales in the U.S. accelerated from 14.8 million to an 17.2 million annual rate. What this means is that Michigan’s economy is clearly an ongoing winner in this expansion, rather than a fading violet. The memorable aspect of this business cycle for Michigan will be that the state’s economy actually excelled over the 2012 to 2015 portion of a matured expansion. Coffers and budgets of state and most local governments reflect the fruits of these improvements — not just in the automotive sector, but in the retail, rental, financial, and small services markets, as well. Perhaps this facet of the upswing is best illustrated by the fact that in just the first half of 2015, most states had not experienced any rise in the number of vehicle dealerships. Michigan, however, with five additional dealerships in operation in just six months, accounted for one-third of all new dealerships nationally over that time period, according to Urban Science, a Detroit-based retail-consulting firm. In addition, metro Detroit home sales in July 2015 were 10 percent higher than July 2014, with median home prices jumping more than 7 percent (to $164,000) during the same midyear annual comparison. The result is that Detroit’s housing market ranked No. 11 among the hottest housing markets in the nation. The second anomaly in Michigan’s recovery is its very profitable dimensions, despite the painful downside of the sudden Great Recession. As we know, the length and depth of the shakeout cut a swath of bankruptcies through much of Michigan’s automotive sector and the city of Detroit. In hindsight, this reality check was fortunate. It served to hasten long-overdue cost-cutting and product rationalization. The ensuing imperatives to reorganize plants, production, personnel, and pensions rippled throughout every county in the state and across nearly every industry, including many public service and nonprofit sectors. Consequently, most firms are now operating with better profit margins and maintain better vigilance, planning, and control over their businesses. Entrepreneurs, managements, and boards of directors face more demanding customers, regulators, and global competition. Competence and accountability are no longer part-time components of job descriptions on the Michigan or U.S. business scene. Without these continuing adjustments and innovations, the automotive component of the Michigan GDP would already have been hobbled by recent, record numbers of auto and truck recalls and large-scale outsourcing of manufacturing activity to other states and overseas sites. So what else is at work? 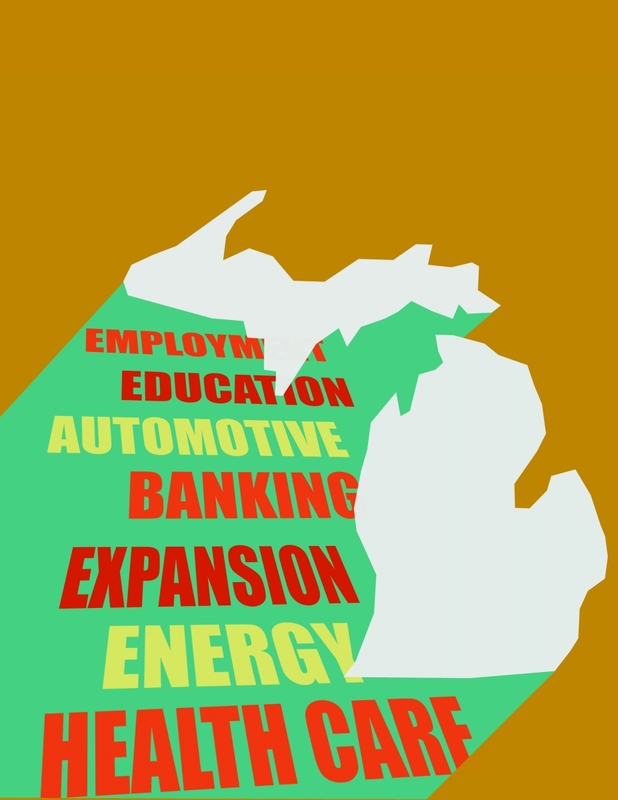 In particular, what factors are likely to underwrite this Michigan-favored scenario into 2016? And, if businesses here play their cards wisely, might not the Detroit area — along with Michigan’s dozen other sizeable regional economies — enjoy an advantage over other states? Another noteworthy factor is that Michigan is experiencing the positive effects of becoming a right-to-work state. More and more, companies are either moving to or expanding their operations in the state, albeit with fewer and fewer subsidies in the form of tax credits. Lessons learned will prove invaluable when the nation inevitably braces for its next downturn. Here’s how, and why. We can expect another year of real U.S. GDP expansion, but averaging only 1.5 to 2.0 percent. This constitutes further slowing from what most observers considered meager growth between 2014 and 2015. As already noted, Michigan managed to celebrate an accelerated business expansion, coincident with obvious braking in general business activity. Nothing that is now occurring on the national or global scene augurs acceleration in the year ahead, however. The boom in natural gas and oil fracking is real, and it’s one of the key ingredients powering our consumer-driven economy. On the other hand, Washington’s outlays for the U.S. military are retrenching. Hand-held technology sales and investments have leveled off. The construction of a north-south continental oil-gas pipeline remains on hold. Chinese, Indian, Japanese, and European Union economies are slowing or are headed into weaker, more turbulent waters, with a recession likely in the case of the EU. Headwinds at home also include prospects of more onerous regulations in banking, health care, education, and energy industries. Higher tax rates, higher borrowing costs, greater national debt and taxation, and probable output disruptions and work stoppages on the labor front are expected. Another reason why this cycle’s lackluster GDP gains may foreshadow 2016 is that deferred demand for new cars and trucks has finally receded as a momentum vector. Yes, it’s true that the median age of vehicles in operation has risen to 11.5 years; drivers of cars and light trucks in 2015 have held on to their vehicles longer than they did in 1990 (6.5 years) or in 1969 (5.1 years). And yet the economic outlook, at least for early 2016, is secure. Although national and international markets lack the momentum of the previous three years, as witnessed by choppy stock markets and commodity prices, at least interest rates are unlikely to rise very much — or very fast — for two reasons. Therefore, the outlook for U.S. 2016 motor vehicle sales — as well as Michigan’s growth prospects — remains positive. There is every reason to believe that basic growth in demand for 2016’s new and improved automotive lineup will prove profitable. A normal replacement cycle of aging cars and trucks and the existing growth of America’s driving-age population (already 6 percent above 2007’s level) are positive factors likely to offset the subsiding wave of pent-up demand and anticipated tightening of financing conditions. In short, we should expect another 17 million-unit motor vehicle sales year in 2016. For Michigan, this implies another strong year of profits with slow, steady improvements in local employment and construction markets. What could be more indicative of our progress than Michigan’s success in reducing unemployment rates? According to the U.S. Bureau of Labor Statistics, as of June 2015, seven of Michigan’s 13 Metropolitan Statistical Areas already showed unemployment rates at or below the 5.1 percent national average. In fact, jobless rates in Grand Rapids, Ann Arbor, and Monroe were well below 5 percent. For August, Michigan announced a statewide unemployment rate of 5.1 percent, matching the U.S. unemployment rate for the first time since September 2000. In the public sector, Michigan’s budget, thanks entirely to private sector prosperity, again reflects balance — albeit at far higher levels of state spending. Furthermore, in 2014, Michigan’s population totals at last turned positive. The estimated metro Detroit population stabilized. Demographic expansion should remain a net positive economic force for most Lower Peninsula metro areas for quite some time. Even so, we can’t ignore the dichotomy emerging from the trenches of metropolitan centers. From New York to California, there are increasingly severe financial strains on cities and counties. In the Midwest, whether tracking Cook County with its core city of Chicago or Wayne County’s core city Detroit, unfunded public pension systems and decaying infrastructures continue to drain vibrancy and post warning signs to firms and individuals considering office expansions or deciding on the viability of plant and facility relocation. These crosscurrents will continue driving influential challenges to Detroit and Michigan in the coming years. Our economic and financial responses to these challenges will determine whether Michigan will take the lead in bridging the next national downturn. The strongest cards in our hand are the harsh lessons from the recent past. We will begin 2016 with the most profitable private sector and the fiscally strongest public sector position enjoyed in many decades. option if the state wants to continue capitalizing on its gains and lead the way in future expansions. How is such leverage acquired? The key is focus. It means hiring the right people, nurturing their careers, and accelerating their learning by providing opportunities for taking risk and responsibility, thereby reinforcing productivity and loyalty in the enterprise. In short, focus on one’s workers pays dividends by avoiding the strikes, accidents, layoffs, and turnovers that have frequently interrupted Michigan’s economic performance over the years. Next, in order to leverage profits, it is vital to secure the benefits of ever-advancing technology. Reinvesting profits promotes virtuous circles: New capital plant and equipment can augment quality control, improve customer response times, and bring down unit costs. Finally, there’s the issue of location, location, location. In this case, targeting where to locate one’s production and marketing facilities will give a firm the ultimate competitive advantages of being better, faster, and less expensive. By honing in on the triad of costs attendant to doing business — labor, capital, and land — entrepreneurs and management throughout Michigan’s private sector can demonstrate the leadership and integrity necessary to gain and retain market share. What about the public sector? What constitutes a symmetrical focus for leveraging Michigan’s public sector workforce and leadership toward the delivery of better, faster, cheaper in servicing taxpayers? State, county, and local governments, along with public school districts, have duties to serve the general public’s interests — issues that are inter-generational in their impact on individual human capital and their demands on taxpayer financial resources. cost levels that enhance Michigan’s long-term competitiveness. Returning preeminence to Michigan’s business climate implies adopting initiatives such as shedding many functions that government cannot do effectively or efficiently, or that require outsourcing via competitive bidding by private sector professionals. Only in this manner will Michigan be served with lower tax burdens, better services, and greater transparency and accountability. Triangulating the effectiveness of incentives throughout the state means aligning the high expectations and responsibilities of public and private sector workforces with their roles as customers and residents. State leaders also must plow through political impediments and develop a plan for infrastructure upgrades and improvements. Focus and diligence are the attributes that have given Michigan a head start in weathering a future recession and leading the pack toward the next upswing. Leveraging our hard-won position means skillfully skirting minefields between now and the next business cycle slump. Michigan, and in particular the Detroit region, have had a most encouraging rebound. Auto and truck sales have risen from annual rates of 10 million to more than 17 million units. It couldn’t have come at a better time.